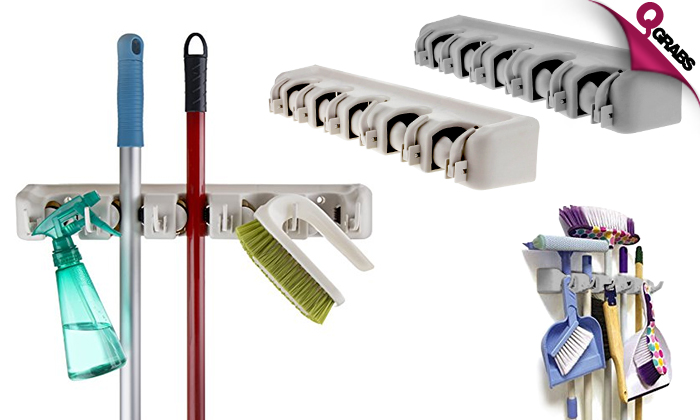 Wall-Mounted Broom & Mop Organizer! Brooms, mops or other household items, this wall organizer is designed to hold it all. Easy to use with a rounded, gravity-controlled rolling ball that automatically adjusts to the handle’s thickness & grips it. Perfect for mops, brooms, golf clubs, pool sticks, tennis rackets, shovels and lots more. Each holder has five handler holders and six retractable hooks for additional storage. Fits most handles up to a diameter of 3.1cm. Includes six wall mounting screws. With up to 54% off, keep the mops in place!